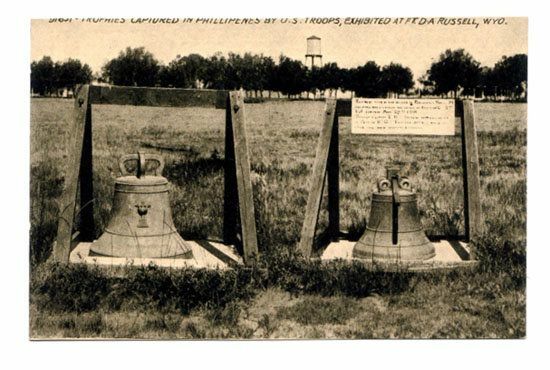 Today, a new fight is emerging over these three church bells of the Philippine–American War, which have inherited different meanings from different groups. For Filipinos, they are a symbol of resistance against a violent American occupation, one estimated to have killed 200,000 to 600,000. For many American veterans and veterans groups, the bells represent the valor of the 48 U.S. troops killed in action that day and the 4,374 Americans killed through the war. For years, lawmakers in Wyoming — where two of the bells are kept — prevented return of the bells through amendments to the National Defense Authorization Act. However, new language in the most recent defense spending bill allows President Donald Trump to return them to the Philippines — a potential move that has been cheered by activists hoping to send the bronze relics’ back to their original owner. Among the veterans community — the population that the spoils are meant to honor — reaction is spilt. Some of the most active proponents for returning the bells are U.S. vets of Filipino descent, arguing they belong to a church and cannot be taken as war booty. There are many others who who think they should remain in the United States’ possession, including those who served in the modern-day version of the unit that fought in the Battle of Balangiga: the 9th Infantry Regiment. 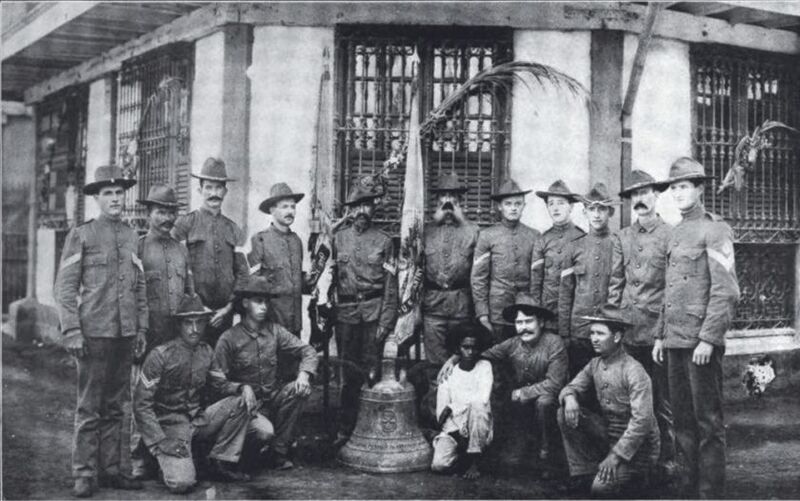 American survivors of the Balangiga massacre pose with a Balangiga bell. Photo taken in Calbayog, Samar, in April 1902. Straddling the middle is Jean Wall, whose father is a Balangiga battle survivor. She once supported keeping the bells, but now supports their return back to the Philippines under certain conditions. Much of what is known about Balangiga is due to Wall’s research group. She grew up hearing the story of the brutal campaign from her father, Adolph Gamlin, who served in the Army. She remembers the scars her father bore on the top of his head and down his back — painful reminders of the day of the ambush. Pvt. Adolph Gamblin arrived off the coast of Balangiga in on Aug. 11, 1901, with the 9th Infantry Regiment. After entering the Spanish–American War, the United States occupied its colony in the Philippines with the help of local rebels. The United States decided to keep the islands instead of granting independence, triggering an insurrection that descended into guerilla warfare. On Sept. 28, 1901, Filipino rebels with machetes had snuck into town wearing women's clothing and ambushed the 9th during breakfast. A force of 34 rushed out from the church while another group of around 500 cut off all escape routes. Survivors recalled hearing the ringing of church bells, possibly to signal the attack or to call for reinforcements. The attack was over in little more than 20 minutes, and 48 of the company’s 78 men died; only three escaped without wounds. American troops returned to Balangiga, set the town on fire, and later bombarded the town with cannons. After the Battle of Balangiga ended 1901, American troops under Gen. Jacob Smith created a “howling wilderness” under orders to kill any male over the age of 10. Historians have long said as many as 50,000 Filipinos (although the number greatly varies) were killed in this retaliatory campaign, although others like Wall have disputed these numbers and have called them and other casualty numbers from that war inflated. Troops out of Wyoming captured two of the town's bells and brought them back home. The 9th took one more, believed to be the bell rung during the battle, and took it back to upstate New York. It followed the 9th to Camp Red Cloud in South Korea, where it currently resides. It was in South Korea that many veterans of the modern day 9th, known as Manchus, encountered the memento and its history. It’s these soldiers who say the Balangiga bell is one of the unit’s most cherished relics and should not be returned. Clifton Trinidad, an American of Filipino descent, served in the 9th as a physician assistant officer from 1989 to 1993. His grandfather fought against the Spanish and the Americans and may have even fought against the 9th back then, he told Task & Purpose. He thinks his grandfather would want it to remain where it is. Despite this bloody history, the unit should not return the bells at this point — and not to Duterte unless he improves his human rights record, said Eric Burke, who served with the modern 9th in Iraq and was the unit’s regimental guidon bearer. “Obviously, from a moral standpoint, the Filipino wars were not the high point of the regiment's legacy,” the 30-year-old veteran said. “There's nothing about that conflict that was anything more than tragic in every single particular. For G. Michael Schlee, the chairman of the American Legion’s National Security Commission, returning the bells could set a dangerous precedent for other historical war trophies. R. Sonny Sampayan-Sampayan, a U.S. Air Force veteran who began working as an activist to return the bells in 1997 and is now envoy of the Catholic Church, says if the United States does not return the bells, the church may have to sue. The current round of negotiations may be the last before the “nuclear option” of a lawsuit. While the Department of Defense in the past has stated the bells are federal property, the Catholic Church argues they are protected religious objects, and, in 2003, sent a letter supporting their return. Sampayan said he visited Arlington National Cemetery on the anniversary of the battle and resolved to find the graves of the some of American generals involved in the Philippine–American War. At one point, he found the gravesite of Gen. Smith, commander of the retaliatory campaign after Balangiga. He stayed at Smith’s grave maybe three or five minutes. “At first I was bitter, because he was the one that ordered to turn Samar into a howling wilderness,” Sampayan said. He said he went to the graves of several generals from that war that day.